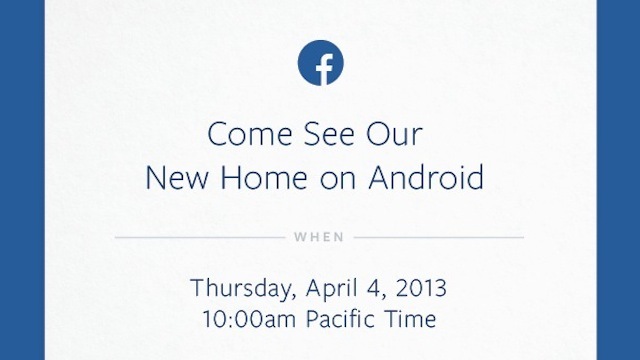 Will Facebook Announce its Facebook Phone in Android Event on 4 April? The team behind Facebook has definitely been working very hard lately. Earlier this year, Facebook introduced Graph Search, a completely new and social way of searching on Facebook. The social network later then announced a redesign to its News Feed page earlier this month, followed by a revamped About page for users. Facebook even tweaked the comment section for company pages on Facebook and soon, 4 April 2013 to be precise, it looks like Facebook has something even more exciting to announce. Over in the U.S., Facebook just sent out an invitation for an Android event saying “Come see our new home on Android”. What could the social network have up their sleeve that has got to do with Android? We can only think of a Facebook phone that has been in the rumor mill for quite some time now, way before HTC announced the ChaCha device with a dedicated Facebook button. If it’s true that Facebook will introduce a Facebook Phone, according to rumors, it’ll be manufactured by HTC, and will run on a modified version of Android with “deep native Facebook functionality”. So, anyone looking forward to a Facebook phone?